Think back, if you can, to your first experience with a Zelda game. For me, this was Skyward Sword, around 7 years ago (I’m just a baby, okay?). The freedom of adventure intrigued me, and having a huge open world to explore (bear in mind this was my first experience with a Zelda game) was an incredible feeling. Eventually, though, I bored of not knowing exactly what to do or where to go. This sense of hopelessness was detrimental to a 12 year old with a short attention span and little patience, and I eventually gave up — temporarily, obviously. But the sense of adventure, the contrast between freedom and hopelessness stuck with me. It became something I longed for in a video game. When I returned to Zelda a few years later, The Wind Waker HD met these cravings, but not for long. Upon returning to Skyward Sword, and every Zelda I’ve played since, I’ve been disappointed with how this sense of adventure is no longer present. It has nothing to do with the games themselves; it’s simply a case of me learning how they work. There’s a sense of adventure present in your first Zelda title that disappears gradually as you play more. In essence, once you’ve completed one Zelda dungeon, every single other dungeon loses its sparkle. 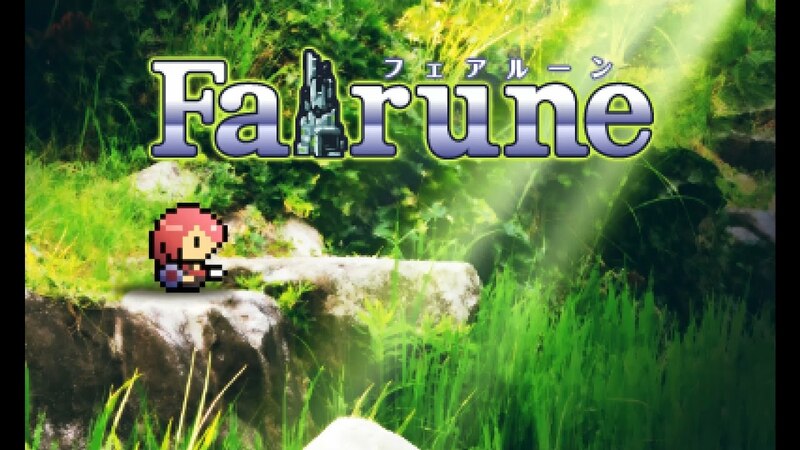 Then along came a game called Fairune. 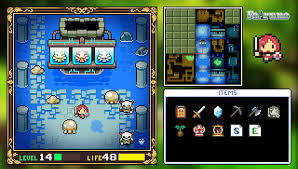 The retro-style puzzle game developed by Skipmore was released for iOS and Android in 2013, then the Nintendo 3DS eShop in 2014. The game’s limited story follows a girl, named simply “The Heroine,” as she traverses the small map, solving puzzles and defeating enemies in a bid to “reboot” her world and save the land’s fairies. Okay, so it’s not exactly a Final Fantasy story, but when has a Zelda game ever relied on its story? The game opens with some vague lore, detailing the events leading up to this tragic but somewhat predictable disaster and giving some vague idea of how you might go about fixing it. Then, it just dumps you at the starting point. That’s it. No helpful arrows or signs to point you in the right direction. Just you, some monsters, and a partially open world. One of Fairune‘s key characteristics is giving the player a deceivingly large world to explore. While it might seem like you could spend hours exploring any direction, only one path will allow you to progress. This is a trait that appears throughout both this game and its sequel. From your starting position, you can go and explore any of four directions. Go anywhere other than upward though, and you’ll find yourself at a dead-end. These other routes will come in useful later, but for now they’re simply there to block your path. You might think a guy like me, with so little patience he gets jitters waiting for revolving doors, would find this a complete nightmare. Not quite. Yes, it’s tough knowing what to do next. Yes, it’s disappointing when it takes you 2 hours to find the exit under that floating tree (yes, a floating tree). However the feeling upon finally finding that item, finally chopping down that tree, finally feeling like you’ve accomplished something after all your hard work more than makes up for it. Not only does it reward you for the blood, sweat, and tears you put in to find the solution, it entices you onward, restarting the entire cycle by giving you another set of paths to take, but with only one true progression. Another key feature of the game is its items. Like in the Zelda series, these can be found scattered throughout the land and will help the heroine along her way. Unlike Zelda, however, they will usually have a very specific purpose. For example, the Pickaxe, found early in the game in an underground cave, only has one use in the entire game. Yes, Zelda dungeons like to shoehorn their relevant item in wherever they can, but nothing as severe as this. This results in a wide variety of items and objects to pick up on your journey. Each comes with a small description and opens up hundreds of new possible interactions (of course, only one will let you progress further). It also forces each item to be completely unique, with its own use and charm. No two items could get confused, simply because their purpose is so specific. Okay, so the story is almost non-existent. And, yes, on your first play through you will get lost and frustrated. You might even be tempted to give up. But you won’t. Because every time you solve a puzzle, every time you find a new path you haven’t walked before, you’ll want more. 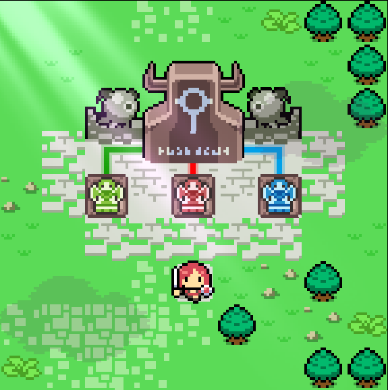 Fairune is what Zelda no longer provides for me. A sense of adventure, and a sense of achievement. Euan Crombie is the host of Zelda Dungeon’s bi-weekly Zelda Speedrunning series, Zelda Runners. In July 2017, he set the current World Record for the 3DS Fairune any% rune. He still can’t quite believe it.